Discover the myths, the legends, and the castles seemingly dreamt up in fairytales on this Eastern Europe Explorer package. No longer overshadowed by the west, Eastern Europe has become the new go-to destination for travellers seeking out a different side of Europe. From Austria to Poland, Romania to Slovakia; this 17 day package showcases it all! Experience the history, culture, landscapes and cuisine of six remarkable countries on this 17 day bucket list tour visiting Czech Republic (Czechia), Romania, Poland, Slovakia, Hungary and Austria. Enjoy free time to explore the evocative streets of Prague, Krakow, Bucharest and Vienna at leisure, then tick off the most iconic sights on guided tours. Visit the lively Slovakian capital of Bratislava, and explore the city of Budapest - often called the ‘Paris of the East’ - on the beautiful Danube River. With return flights, 14 nights hotel accommodation, English-speaking tour leader and guides, return airport transfers and more, this trip is the perfect way to experience the cultural resurgence of Eastern Europe first hand. Today depart from Sydney, Melbourne, Brisbane, *Adelaide or Perth for Vienna, Austria. Fly with airlines such as Etihad Airways, Emirates, Qatar Airways or Swiss Airlines to name a few (subject to availability). Welcome to Vienna! Upon arrival be met by a tour representative and transferred to the hotel. Relax for the rest of the day. After breakfast at the hotel, enjoy a half day guided tour of the city (entrances not included). You will follow the Ringstrasse, the central area where the Opera, the historic Art Museum, Parliament, the City Hall, University, and National Theatre are located. You will also see the Prater neighbourhood with its panoramic Ferris wheel, and perhaps Vienna’s most famous attraction – St. Stephen’s Cathedral. Enjoy the remainder of the day at leisure in the Imperial Capital city of Austria. Today, depart for an orientation tour of Bratislava, the capital of Slovakia, with your Tour Leader. See the Gothic Cathedral, the Archbishop Palace, the Opera, the Tower of St. Michael and more. Afterwards walk through the main square before continuing to the Bratislava Castle, perched atop a hill providing beautiful views of the city below. This afternoon continue to Prague where you will stay overnight. After breakfast at the hotel, join your local guide for a half day tour of the city (entrances not included). Visit the Hradcany Borough (the Castle district) where you will see the Royal Castle “Hrad”, the “Zlata Ulicka” (Golden Street) and the Gothic Cathedral of St Vitius. Afterwards, visit Mala Strana (Lesser Town) where you will then see St Nicholas Church, a masterpiece of baroque art. Enjoy the afternoon at leisure to discover the ‘City of the Hundred Spires’. Perhaps try some of the Czech Republic’s famous beer at one of the many traditional pubs serving a variety of different ales and local gastronomy. After breakfast continue your journey to Wroclaw, a city on the Oder River in western Poland. It’s known for its Market Square, lined with elegant townhouses and featuring a beautiful fountain. In the afternoon enjoy a panoramic tour with your tour Leader of the historical centre of Wroclaw (entrances not included). See the Market Square in the Old Town, City Hall and the Gothic Church of Our Lady. After breakfast, depart to the capital of Poland, Warsaw. Rising from the destruction caused by WWII, the city has been completely rebuilt using old paintings, maps and even people’s memories. Upon arrival, enjoy a panoramic tour with your tour Leader of the Old town’s Market square, Krakowsskie Przedmiescie Boulevard, Chopin’s monument and the Belvedere Palace. Today enjoy a day at leisure in the beautiful city of Warsaw. Today Warsaw is considered an “Alpha” global city, a major international tourist destination and significant cultural, political and economic hub. The diverse architecture reflects the city’s long, turbulent history, from Gothic churches and neoclassical palaces to Soviet-era blocks and modern skyscrapers. This morning continue to Czestochowa. The city is known for the famous Pauline Monastery of Jasna Góra (entrance and local tour guide included), which is home to the Black Madonna painting, a shrine to the Virgin Mary. Every year, millions of pilgrims from all over the world come to Częstochowa to see it. Afterwards depart to Krakow for the night. Today explore Krakow at leisure. The city's medieval old town is one of the finest in Europe. Check out the youthful restaurants, bars and cultural hangouts. Take a walk through the historic Jewish Quarter of Kazimierz before walking along Wisla River or discover Krakow's Main Square, St Mary’s Basilica, St Florian's Gate and much more. 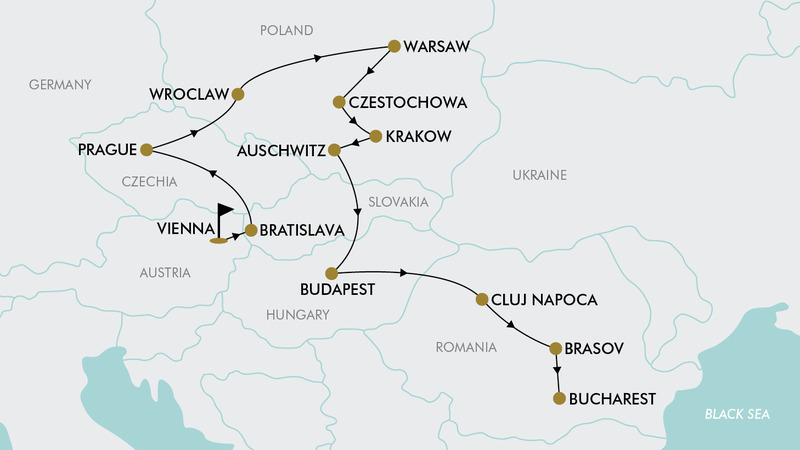 After breakfast at the hotel, travel to Auschwitz for a guided tour of the largest Nazi concentration camp, built and operated by the Third Reich, annexed by Nazi Germany during World War II. Afterwards, continue to Budapest, the capital of Hungary for the night. Today enjoy a half day tour with a local guide of Budapest, starting in the Buda side of the city (entrances not included). See the Buda Castle, Saint Mathias Church, the Fishermen’s Bastion and more. Afterwards visit Pest side of the city. Here you will see the stunning Royal Palace and the Citadel. Enjoy the rest of the day free at leisure. Today depart to Romania’s Cluj-Napoca, the unofficial capital of the Transylvania region. It's home to universities, vibrant nightlife and an energetic multicultural environment. Upon arrival enjoy the afternoon at leisure. Enjoy breakfast before leaving Cluj-Napoca for Brasov in the Carpathian Mountains of southern Transylvania. The city is home to Bran Castle, better known as ‘Dracula’s Castle’ (entrance not included). Enjoy a walking tour with your Tour leader of the main attractions of this medieval city. See the narrow Rope Street, The Black Church, The First Romanian School, and the District of Schei, the old Romanian district. After breakfast continue to Bucharest the capital of Romania, which used to be called ‘Little Paris’. Upon arrival meet a local guide for a half day tour of this amazing city. The panoramic tour includes the University Square, the Patriarchal Church, the Stravropoleos Monastery and the Parliament building (entrances not included). Enjoy the rest of the day at leisure. You may like to visit the Arcul de Triumf (identical to the Arc de Triomphe from Paris) or Lipscani, the old town of Bucharest. Today at the appropriate time you will be transferred to the airport for your return return flight home to Australia. Please note: if your flight departs early, breakfast will be arranged for pick up from the hotel reception the night before. Please note: due to flight scheduling and availability, some flights may arrive in Australia +1 days. Travel offer is valid for travel on selected dates until the 29th of October 2020. For solo travellers a mandatory single supplement of $1155 applies. Please note: dates/months with a * incur a flight high season surcharge of $300 per person. Air France, KLM, Etihad Airways, Emirates, British Airways, Singapore Airlines, Cathay Pacific, Virgin Atlantic, Royal Brunei, Lufthansa, Swiss Airways, Austrian Airlines, Scandinavian Airlines, Qatar Airways, Finnair, Virgin Australia, Thai Airways, Korean Airlines, Malaysia Airlines, China Southern Airlines, China Eastern Airlines, Turkish Airlines, Oman Air, Garuda Indonesia, Vietnam Airlines, Air China, China Airlines, Malindo Airlines plus codeshare partners (subject to availability). $200 per person, subject to availability. - Singapore stopover is not available during the Singapore Grand Prix (dates yet to be released). - Business Class (International Sectors Only): Buy now for $6999 per person. Please note: extra nights are subject to availability until the time of booking. Airport transfers are not included if you wish to arrive early or stay behind. 3 People (subject to availability). - Valid for Children 8 years old and over. No discounts apply for 3rd person travelling. Full price applies, subject to availability. Please note: Triple shares may be required to share existing bedding. Twin or Double bedding (subject to availability). Minimum group size 30, maximum group size 50 per vehicle. - Visa fees and requirements (Not required for Europe if travelling on an Australian passport for stays up to 90 days). - Meals/beverages not stated in the itinerary. - Recommended gratuities/tipping €5 per person, per day. May is known for mild temperatures that are ideal for sightseeing, with highs climbing to 21 degrees, however it is still a good idea to bring a lightweight rain coat. August is the middle of Summer, so expect hot and humid days with temperatures averaging 26 degrees. October in Eastern Europe brings an array of brilliant Autumn Colours. Expect a few crisp mornings, and be prepared to dress in layers. Daily breakfast is included in the tour, for all other meals; lunches and dinners the tour leader (when available) will offer assistance with reservations, suggestions and directions to local restaurants. It is your responsibility to notify TripADeal of any dietary requests/requirements. Please note; we will do our best to meet your requests/requirements, however cannot guarantee that we will always be able to. Gratuities (tips) are not included in the tour price for services of the tour leader (when available) and driver throughout the tour. The recommended tip is €5 per person per day this covers the guide/leader and the driver, which will be collected whilst on tour.